Colorado Peak Politics | UDALL SURRENDERS TO PARTISANSHIP: What Will Sen. Bennet Do On Hagel Nomination? UDALL SURRENDERS TO PARTISANSHIP: What Will Sen. Bennet Do On Hagel Nomination? Senator Mark Udall today did what he always does: bowed to partisanship on a key vote before the U.S. Senate. Udall, who literally ignored the pleas of Pinon Canyon ranchers who urged him to vote against Hagel, joined a party-line vote of Democrats to usher Hagel from the Senate Armed Services Committee and to the full Senate. Udall never bucks his party when it is time to vote. Always good for a press release, a letter or some other contrivance to engineer the appearance that he is something other than a party hackjob, Udall is never one to stray from party allegiance when it is time to vote. By the way it wasn’t only ranchers who Udall ignored. Lynn Bartels tweeted an interesting comment last week. She says Democrats like Udall are being less than consistent by championing gay equality at the same time they give Hagel a free pass. Yet Udall did what he always does — voted for party. Now all eyes turn to Bennet, who not long ago embarrassed the heck out of Udall by bucking Democrats in voting against a debt ceiling deal that fixed nothing. Now everyone is wondering whether Bennet will do it again on the Hagel nomination. Up until now Bennet has been the most quiet Senator on Hagel. He hasn’t tipped his hand one way or the other about how he is going to vote. Now his vote is coming into the fore. Ross Kaminsky is out with a really interesting piece in the American Spectator that focuses on Bennet and how he might vote on Hagel. Kaminsky suggests that Bennet’s close ties to the Jewish community, and his strong stand on gay rights issues, could be important. Yet Senator Bennet has been as shy as an Amish woman visitingSturgis about whether he intends to support Hagel’s nomination. …living here in Colorado, I am painfully aware that Michael Bennet is Colorado’s junior senator only because his Republican challenger in 2010, Weld County District Attorney Ken Buck, fell headfirst into the mire of a David Gregory gotcha question on the subject of homosexuality on Meet the Press just prior to the election. In a debate that should have been about out-of-control government spending and high unemployment, Gregory (like George Stephanopoulos, Bob Schieffer, and other such Democratic Party activists) was looking for any way to sidetrack the conversation. He asked Mr. Buck if he believed that homosexuality was a choice. Buck, who should have said “this election is about jobs and the economy, not my views on gays” answered yes, and went on to inartfully compare homosexuality to alcoholism (in terms of possible genetic predisposition). It played right into the Bennet campaign’s strategy of painting Mr. Buck as “extreme” and “outside the mainstream of views” (a phrase which David Gregory helpfully offered to Bennet during that interview). In the end, Bennet beat Buck by 1.7 percent of the vote, trouncing Buck among women by 16 percent and, critically, among unaffiliated voters by 11 percent despite the GOP winning nearly 60 percent of independent voters nationally that year. Michael Bennet is a U.S. Senator because a Republican made controversial statements about homosexuality. And yet on the subject of the openly, aggressively anti-gay Chuck Hagel, Bennet remains silent. 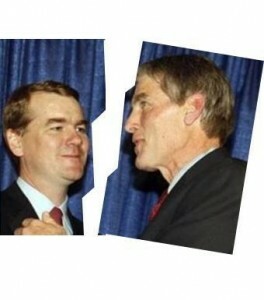 Kaminsky is obviously skeptical that Bennet will cross Udall. We aren’t confident of it either. But it does present a real opportunity for Bennet. If the left opposes Hagel for his previous anti-gay attacks, the right opposes him because he wants to negotiate with Hamas, and Colorado ranchers oppose him because he doesn’t support their property rights, Bennet may ask…why not?